2. Combine the flour, paprika, salt flakes and black pepper. Sprinkle this mixture over both sides of the chicken pieces. 3. Put the onion wedges into the pan and then add the chicken, skin side up into a large roasting pan, and drizzle with the oil. Roast for 25-30 minutes. 4. Measure the chicken stock into a jug and add the ginger, garlic, zest and honey. Pop it into the microwave for 20 or 30 seconds to heat the mixture and melt the honey into it all. 5. Pour the glaze over the chicken and pop it back into the oven for another 10-15 minutes, or until the chicken is burnished golden. 6. 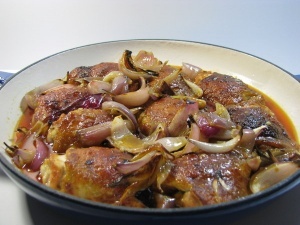 Serve with rice and some green vegetables pour the delicious juices over the rice, a piece of chicken and some braised onion. Sprinkle liberally with coriander leaves.